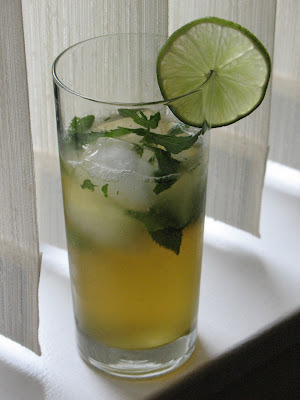 I had some mint I wanted to use up and mojitos seemed like a logical means to that end. But I also had mezcal on the mind, so I decided to use that instead of rum, along with a dash of pear brandy for some fruit flavor. Add mint and agave nectar to glass and muddle. Add ice, lime juice, mezcal, pear brandy and club soda. Lightly shake by pouring into a shaker cup and then back into the glass. Garnish with lime wheel. When confronted with excess mint, you create a cocktail to put it in. This is why I married you. This sounds like a great idea -- I love pears and how can you go wrong with a smoky mezcal? Thanks! I love adding mezcal to cocktails for a little smoke. I was on a real mezcal kick last year.